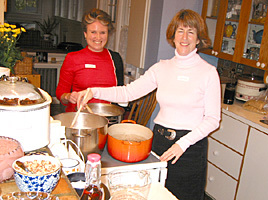 Sheila Knox and neighbour Donna Walsh agreed readily to host another "trial" party. They raised a considerable amount of money for the brand new Centre for Research in Neurodegenerative Diseases Parkinsons Fund, Faculty of Medicine, University of Toronto. All photos in this series courtesy of Paul Joe. 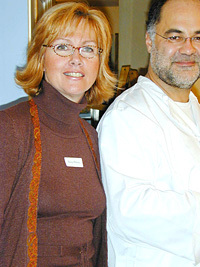 Noel MacDonald and Joe Rubin feed Mary Hynes, greeter. 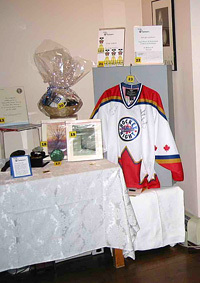 The silent auction had all kind of goodies, including a jersey signed by Ron MacLean and Don Cherry.